Make this Christmas that's full of love and happiness! My family will celebrate Christmas in Mindoro, our hometown with my Mommy, Ate and Kuya and of course, my brother in law. My sister is 6-months pregnant, this makes this Christmas very special. We will still miss the presence of our Daddy. Sigh! Wherever you are Daddy, I love you so much. I hope you are in heaven now. 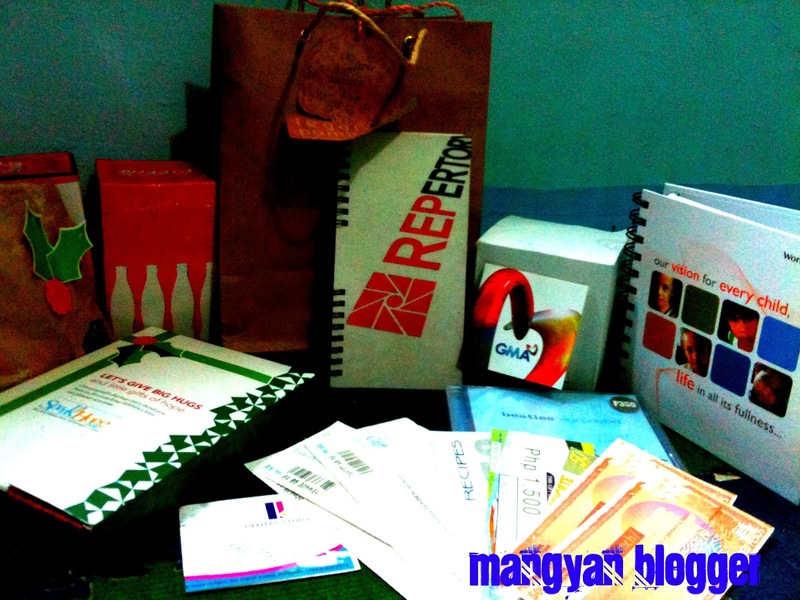 Thanks to the people who exerted efforts for this gifts. I love Christmas because there's plenty of chocolates, candies and all the foods served are all dilicious. I love the wonderful feeling of receiving Christmas cards and gifts from friends in far away places. In fact, I still have with me a box full of cards that I have received all these years. I always love to collect them especially the love letters. And I love hearing and singing Christmas carols make my heart sings. I also love Christmas because of its commercialism, optimism in the face of really bad (but sometimes romantic) weather, presents, food and also as an excuse to party! And I want to add.... the decorations wherever I go! This Christmas season I want to make sure I express my gratitude to each one of you for reading my blogs and to my subscribers for being there for me with your comments of love and joy!